The plots of fictional stories sometimes turn on facts that lie outside the real world. For example, Achilles is invulnerable except for his heel. Kryptonite robs Superman of his powers. Dont feed Gizmo after midnight or youll be plagued by gremlins. Say Beetlejuice three times and hell appear. If an audience is to make sense of a fantasy universes mythology, any arbitrary rules and their consequences have to be spelled out. In Lerner and Loewe's 1947 musical Brigadoon, set in Scotland, the necessary exposition is delayed almost until the intermission. This adds an element of mystery. 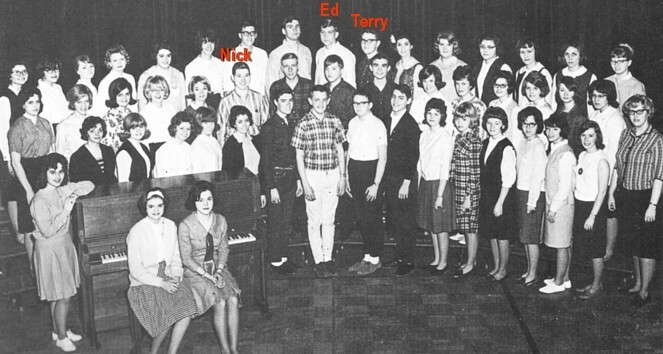 Richwood High School presented Brigadoon on April 9, 1965, when I was a senior. I wasnt part of the cast, but I knew most of the people who were, and I hung around during many of their after-school rehearsals. The next year, while I was away at college, ABC televised Brigadoon on October 15, 1966. Until recently I wasnt aware of this 90-minute special, and only a low-quality off-the-air recording survives. But I enjoy seeing TV techniques from my youth. Familiar faces include Robert Goulet (here with Sally Ann Howes), Peter Falk, and four-time Oscar nominee Marsha Mason. I had no idea Marsha could sing and dance and affect a flirtatious Scottish accent. While most of the show was shot in a studio like a drama from the Golden Age of Television, or like a soap opera even today, there were a few outdoor sequences performed on a sunny southern California hillside. The skies were blue, not sable as the chorus claimed, and it didnt much resemble Scotland. At least ABC sent a truck out there with an electronic camera and a video tape recorder. British productions (even Fawlty Towers a decade later) would shoot their occasional exteriors on film  a jarringly different look from the rest of the scenes, shot with real TV studio cameras. You can watch the 1966 show here. Ill Come Home to Bonnie Jean is performed not by Nick Taylor but by a singer Id describe as an Irish tenor, beginning at the 16:14 mark. The story goes like this: Two Americans have stumbled across a Scottish village called Brigadoon. Its not on any map, and its inhabitants are completely unaware of the modern world. This peculiar situation is explained halfway through the show. In a scene beginning at 41:56, village elder Mr. Lundie reveals to the Americans that because of a miracle, the town exists for just a single day every century. When it reappears 100 years later, its inhabitants perceive it as only one day later. Outsiders can come and go; but if a citizen ever departs, the town will disappear forever. In the Richwood High School Mixed Chorus production, Terry Rockhold wore a green kilt to play Mr. Lundie. Unfortunately, on the night of the performance he mistakenly omitted a sizable portion of his speech, leaving the audience uninformed about the no-exit rule. In the next scene, after a sword dance, a disgruntled citizen (I canna abide) shouts that hes leaving. Everybody joins in a desperate chase to prevent him. But, one might wonder, why the desperation? Why do they care? Good riddance. The village is saved. (What a day this has been!) Then it disappears for a hundred years.